Refugees crossing the border between Serbia and Hungary. Geovien So/Demotix. All rights reserved.While the Hungarian government uses a timeless mix of methods – fences, racism, police force, self-pity and tear gas amongst others – to argue against the right of people to flee war and attempt to gain sanctuary in Europe, we must remember it is not the only country doing so. The widespread coverage of refugees escaping into cornfields in an attempt to avoid registration was depicted in western media as another sign of Hungarian heartlessness and incompetence; within Hungary, however, it was yet another demonstration of the lawlessness and disorder of refugees. Now, refugees crossing the Hungarian border are arrested. 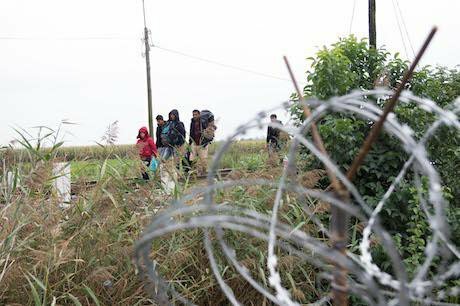 Escalating the impression of conflict served the Hungarian government well: it legitimises the criminalisation of refugees crossing the military-protected razor-wire fence, punishable with three years’ prison. A sad black comedy: refugee camps - no; prisons - yes.